iTurnOff is a simple and professional computer shutdown software that helps you automatically shutdown, power off, reboot, hibernate, suspend, log off, or lock up computers at scheduled time you specified. It can shut down computer at scheduled time even when no user is logged in. 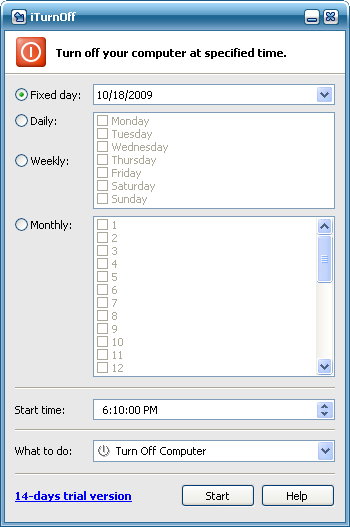 It gives you different ways to schedule the shutdown event for your needs, such as daily, weekly, monthly and fixed day. Administrator rights required for installation. iTurnOff is a simple and professional computer shutdown software. * Turn off/restart/log off/hibernate your computer at specified time. * Turn off your computer at specified time every day/week/month. * Turn off computer at specified time even if no one is logged in. * Administrator rights required for installation. * iTurnOff support for minimize the window to system tray icon. Qweas is providing links to iTurnOff 6.42 as a courtesy, and makes no representations regarding iTurnOff or any other applications or any information related thereto. Any questions, complaints or claims regarding this application iTurnOff 6.42 must be directed to the appropriate software vendor. You may click the publisher link of iTurnOff on the top of this page to get more details about the vendor.